Objectives Estimate and compare the risk of mortality in patients whose antidiabetic therapy is modified to include pioglitazone compared with an alternative antidiabetic medication at the same stage of disease progression. Setting Pooled analysis of clinical data collected from primary and/or secondary care settings in four European countries: Finland, The Netherlands, Sweden and the UK . Participants 56 337 patients with type 2 diabetes mellitus first prescribed pioglitazone between 2000 and 2011, and 56 337 patients never prescribed pioglitazone matched by treatment stage, history of diabetes, diabetes complications and cardiovascular disease, and year of cohort entry using exact and propensity score matching. Patients were followed-up for a mean of 2.90 (SD 2.21) and 2.83 (SD 2.37) years in the pioglitazone-exposed and non-pioglitazone-exposed groups, respectively. Outcomes All-cause mortality ascertained from clinical or registry data. Mortality was a planned secondary outcome in a study primarily studying the association of pioglitazone use with bladder cancer risk. Results The crude overall mortality rate per 10 000 patient years was 206 (95% CI 199 to 213) in the pioglitazone-exposed group and 448 (95% CI 438 to 458) in the non-pioglitazone-exposed group. The crude HR comparing pioglitazone to alternative antidiabetic exposure was 0.46 (95% CI 0.45 to 0.48). This reduced in magnitude to 0.67 (95% CI 0.64 to 0.70) following further adjustment for matching variables, propensity scores, age, gender and time-dependent variables representing use of alternative antidiabetic drugs. Conclusions In this large observational cohort study of patients with type 2 diabetes, pioglitazone exposure was associated with a statistically significant decrease in the risk of all-cause mortality across four European countries. Results should be interpreted with caution due to the potential for residual confounding. Protocol registration European Network of Centres for Pharmacoepidemiology and Pharmacovigilance. Evidence from the large Prospective Pioglitazone Clinical Trial In Macrovascular Events (PROactive) and Insulin Resistance Intervention after Stroke (IRIS) trials indicates that pioglitazone did not increase or reduce the risk of death from any cause in patients with type 2 diabetes at high-risk of cardiovascular disease (PROactive) or prediabetic patients with a history of ischemic stroke or transient ischemic attack (IRIS). Observational studies and meta-analyses of smaller randomized trials studying the risk of cardiovascular events have demonstrated a statistically significant reduction in the risk of all-cause mortality with pioglitazone use. This pan-European, observational, retrospective large cohort study indicates that prescribing pioglitazone compared with an alternative treatment decision at the same stage of disease progression was associated with a statistically significant 33% reduction in all-cause mortality. This further supports the safe use of pioglitazone. Additional research is recommended to evaluate the association of pioglitazone use with all-cause mortality. The primary objective of this pan-European multidatabase cohort study was to investigate the risk of bladder cancer associated with pioglitazone use compared with other diabetic drugs at the same stage of treatment in patients with T2DM. Results were recently published.20 Here we present findings from the secondary outcomes: all-cause and bladder cancer-specific mortality. This pan-European multidatabase retrospective cohort study used six non-overlapping datasets from four European countries: Finland (FIN), the Netherlands (NL), Sweden (SWE) and the United Kingdom (UK). Data from the PHARMO Database Network and Clinical Practice Research Datalink (CPRD) were used in the NL and UK, respectively. Drug exposure data were based on prescription data in the NL general practitioner (GP), UK GP, and UK GP hospital (GP-HOSP) datasets, and on dispensing data in the FIN, SWE and NL HOSP pharmacy (PHARM) datasets. 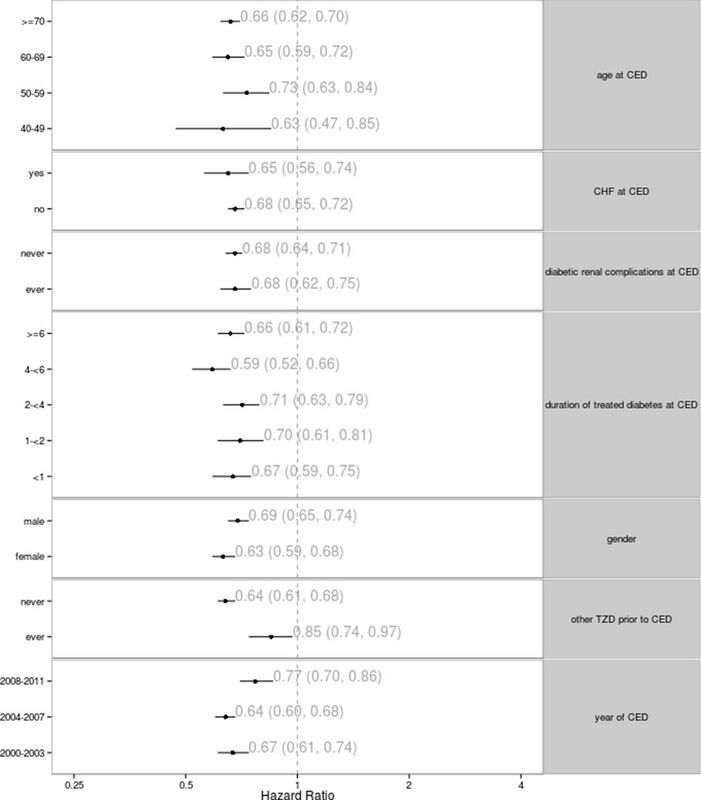 All-cause and bladder cancer-specific (International Statistical Classification of Diseases and Related Health Problems 10th Revision (ICD-10) code C67) mortality were measured in linked national death records in FIN, SWE, NL-PHARM-HOSP and UK GP-HOSP datasets. All-cause mortality was identified using GP medical records in the NL GP and UK GP datasets. Further data to identify the study cohort and adjust for covariates was obtained from cancer registries, hospital discharge records, migration records, and national diabetes registers where available. The study period start and end dates respectively ranged by dataset from 1 Jan 2000 to 1 July 2006 and from 31 December 2010 to 30 June 2011. The study population included patients over the age of 40 with T2DM whose diabetic treatment regimen was altered to include pioglitazone or any other antidiabetic medication during the study period. Potential cohort entry dates (CEDs) were set as the date of the first-ever pioglitazone prescription for pioglitazone-exposed patients and the date of switching to or add-on (initiation) of any other antidiabetic medication for the non-pioglitazone-exposed group. CEDs were excluded if there were under 12 months’ membership in the medication database, any indication of bladder cancer prior to the CED, or if patients were concurrently exposed to another thiazolidinedione. Guidelines for prescription of antidiabetic drugs recommend a stepwise approach that takes into account the efficacy of each drug substance in controlling blood sugars and the different safety profiles. Pioglitazone is therefore ‘channelled’ to patients at a specific stage of diabetes and with other characteristics that affect their prognosis. The following approach was therefore taken in an attempt to eliminate channelling bias.21 Propensity scores (PSs) were estimated for each CED using a weighted logistic regression model with weights reciprocal to the number of CEDs per individual. The PS model included baseline binary and categorical variables that were likely to have a direct impact on treatment choice and could be measured in all datasets. These included: antidiabetic treatment immediately prior to CED, whether the treatment change at CED was an add-on or switch in therapy, use of thiazolidinediones prior to CED, duration of treated diabetes, number of different antidiabetic medications used prior to CED, history of MI, stroke, heart failure, and the following diabetic complications, retinopathy or maculopathy, severe lower limb complications, renal complications, ketoacidosis, and hyperosmolar or ketoacidotic coma—duration of prescription database membership and calendar year of CED. Pioglitazone CEDs were 1:1 fixed ratio matched and 1:10 variable ratio matched to non-pioglitazone CEDs using the PS distance and the following exact matching variables: antidiabetic treatment immediately prior to CED, whether the treatment change at CED was an add-on or switch in therapy, and use of thiazolidinediones prior to CED. Non-pioglitazone exposed patients were removed from further matching when one of their CEDs was matched to a pioglitazone-exposed patient. The number of matched non-pioglitazone-exposed patients varied between patients and countries in the 1:10 matched cohort resulting in an imbalance in characteristics. The main analysis was therefore based on the 1:1 fixed ratio matched cohort. Each patient was followed-up from CED until date of death or censorship due to end of membership of the database, end of database coverage, start of other thiazolidinediones or 30 June 2011. Time-varying (TV) covariates were generated to improve the estimation of adjusted HR. New binary TV covariates for use of each alternative antidiabetic treatment class and comorbidity history were generated for inclusion or testing in the regression model. Use of antidiabetic treatment group other than pioglitazone and comorbidity history was categorized as ever versus never used and ever versus never occurred up to any given time period. Age categories were fixed at baseline. A pooled analysis was performed using all six cohorts. Descriptive data and standardized differences comparing the pioglitazone-exposed and non-pioglitazone-exposed groups were presented in the primary manuscript.20 Crude all-cause and bladder cancer mortality rates were estimated with 95% CIs using Poisson regression. HR were generated using a Cox proportional hazards (PH) model including the ever versus never exposure variable and a categorical dataset variable. Adjusted models also included as covariates age, gender, antidiabetic medications, exact matching variables, PS quintiles, and all variables that were included in the PS. Further covariates were included as confounders if their inclusion resulted in a minimum of 10% change in the HR of primary exposure (ever vs never exposed to pioglitazone) when introduced into the crude model. The PH assumption was examined by inspection of the Kaplan-Meier curves. Adjusted HRs were stratified for potential effect modifiers including age, gender, duration of treated diabetes at CED, year of CED, use of thiazolidinediones (other than pioglitazone) prior to CED and history of renal complications and congestive heart failure (CHF) at CED. 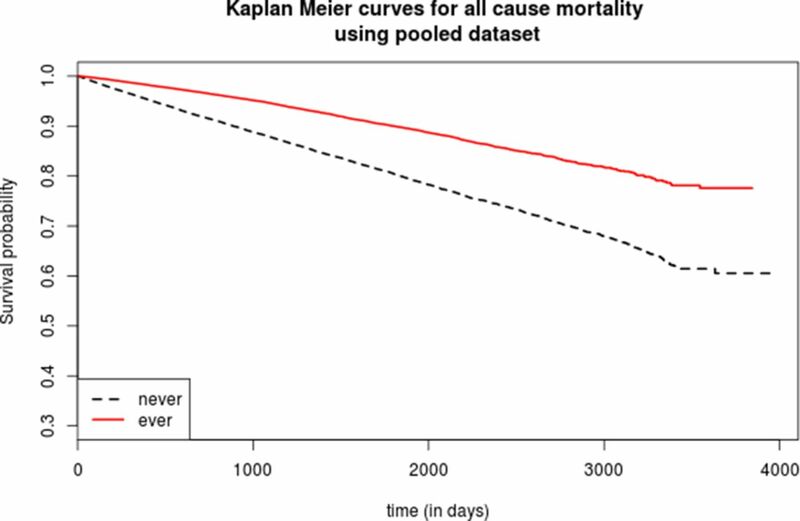 Primary analyses for each of the two mortality endpoints included all datasets in which the endpoint was recorded. A number of preplanned sensitivity analyses assessed the robustness of the results with respect to outcome, exposure and follow-up definitions and the inclusion of baseline smoking, baseline body mass index and TV HbA1c as covariates. These covariates were not available for the FIN and NL-HOSP populations and missing variables were treated as a separate category. Further details about the study methodology are published in the BMJ20 and in the European Network of Centres for Pharmacoepidemiology and Pharmacovigilance (ENCePP) E-register of studies (study title ‘Pan-European Multi-Database Bladder Cancer Risk Characterisation Study’). The complete 1:1 matched cohort included 56 337 patients in both the pioglitazone-exposed and the non-exposed groups. Descriptive statistics reported previously for the primary bladder cancer analyses20 demonstrated good covariate balance within the variables used in the matching process. The standardized differences for the proportion of patients with CHF, early cohort entry (2000–2003), and higher duration of medication database membership before CED (5–6 and 7+ years) marginally exceeded 10, the lower threshold that we set for good balance. Descriptive statistics for a selection of covariates are provided in table 1. The number of antidiabetic treatments prescribed at CED was similar in both cohorts. The most commonly prescribed treatment regimens in the never exposed to pioglitazone group were insulin alone or in combination (36.99%), metformin or SU in combination (21.41%), or combinations of other antidiabetic drugs (31.10%). Pioglitazone was prescribed in a variety of treatment regimens: most commonly in combination with metformin (34.83%) or metformin and SU (24.25%). A total of 10 513 deaths occurred during follow-up in the 1:1 matched cohort. There were 3370 deaths in the ever exposed to pioglitazone group during a mean follow-up time of 2.9 years, and 7143 deaths in the non-pioglitazone-exposed group during a mean follow-up time of 2.8 years. The crude all-cause mortality rate per 10 000 person-years was 206 (95% CI 199 to 213) for patients ever exposed to pioglitazone and 448 (95% CI 438 to 458) for patients never exposed to pioglitazone. The Kaplan-Meier curve is consistent with the PH assumption (figure 1). Kaplan-Meier plot of association of exposure to pioglitazone with all-cause mortality in patients with type 2 diabetes. Never: never exposed to pioglitazone. Ever: exposed to pioglitazone. 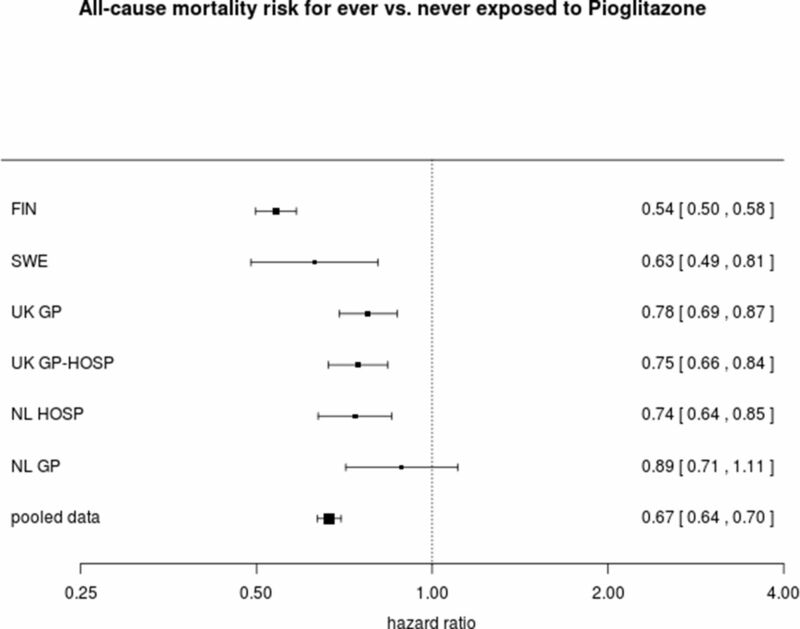 A statistically significant 33% reduction in all-cause mortality was observed for ever exposed to pioglitazone compared with never exposure to pioglitazone (adjusted HR 0.67, 95% CI 0.64 to 0.70). Observed reductions were statistically significant in five of the six datasets. Relative risk reduction ranged from 11% in the NL GP to 46% in Finland. In the 56 337 patients in the pioglitazone cohort, 23 123 and 6462 patients received pioglitazone for at least 18 and 48 months, respectively. Total cumulative pioglitazone dose exceeded 14 000 mg for 22 550 patients and 40 000 mg for 7226 patients. Observed reductions were statistically significant for all doses and durations of exposure. The HR estimates for all-cause mortality are presented in figures 2 and 3. No additional variables met the inclusion criteria for confounders. The adjusted model therefore included age, gender, antidiabetic medications, PS quintiles, and all variables that were included in the PS model. Full model results are presented in the supplementary appendix. Number of events, the crude incidence rate, and the crude and adjusted HR with 95% CI for the association between pioglitazone use and all-cause mortality. Crude model: pioglitazone exposure variable and a dataset identifier. Adjusted model: Crude model plus, age, gender, use of metformin, use of sulphonylureas, use of insulin, and use of other antidiabetic drugs, all exact matching variables, propensity scores as quintiles, all propensity score variables evaluated at cohort entry date. Adjusted HRs with 95% CI for the association between pioglitazone use and all-cause mortality for each dataset. The HRs and 95% CIs are presented in the original scale and the figure is plotted in the log scale. FIN, Finland; SWE, Sweden; United Kingdom GP, UK general practitioner; UK GP-HOSP, UK linked dataset; NL HOSP, Netherlands hospital data; NL GP, NL general practitioner. For patients with current pioglitazone exposure, there was a significant 60% reduction in all-cause mortality compared with never exposure (HR 0.40, 95% CI 0.37 to 0.43). With regard to cumulative dose and duration of pioglitazone use, a similar significant reduction in mortality risk was observed for all exposure strata. A statistically significant reduction in mortality risk was observed in all stratified and sensitivity analyses. The adjusted HR for patients prescribed and not prescribed thiazolidinedione prior to cohort entry was 0.85 (95% CI 0.74 to 0.97) and 0.64 (95% CI 0.61 to 0.68), respectively. This was the only stratified analysis in which the confidence intervals did not overlap (figure 4). Adjusted HRs with 95% CI for the association between pioglitazone use and all-cause mortality stratified by key variables. CED, cohort entry date; CHF, congestive heart failure; TZD, thiazolidinedione. The pooled dataset for the bladder cancer mortality analysis included 34 615 patients in the 1:1 matched pioglitazone and non-pioglitazone exposed groups. A total of 21 deaths due to bladder cancer occurred during follow-up including seven deaths in the pioglitazone-exposed group and 14 deaths in the non-pioglitazone-exposed group during a mean follow-up time of 2.7 years in both groups. The crude bladder cancer-specific mortality rate per 10 000 person-years was 0.75 (95% CI 0.36 to 1.57) for patients ever exposed to pioglitazone and 1.50 (95% CI 0.89 to 2.54) for patients never exposed to pioglitazone. A statistically non-significant 39% reduction was observed in bladder cancer cause-specific mortality for ever exposed to pioglitazone compared with never exposed to pioglitazone (adjusted HR 0.61, 95% CI 0.23 to 1.67). The adjusted model only included all the predefined covariates. Due to the small number of events, additional covariates or other exposure definitions were not considered. Our analysis of this large pan-European retrospective cohort study found a statistically significant 33% reduction in risk of all-cause mortality in patients with T2DM whose antidiabetic therapy was modified to include pioglitazone compared with an alternative antidiabetic medication at the same stage of disease progression. Comparators included a full range of antidiabetic treatment regimens from metformin alone (11%) to insulin used alone or in combination (36%). Findings for bladder cancer-specific mortality estimated a similar 36% decrease with broad CIs consistent with a 77% decrease or a 67% increase, reflecting the small number of cases. 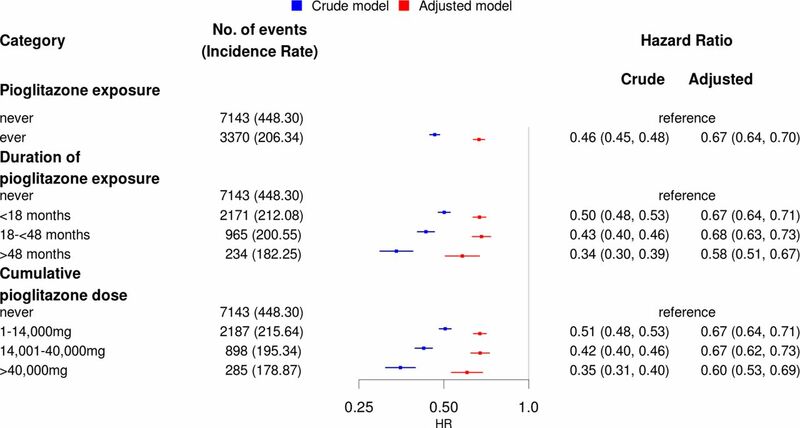 General strengths and weaknesses of the study have been reported previously.20 The cohort matching and regression modeling processes were designed for the primary outcome of incident bladder cancer. There is therefore a risk that important covariates influencing the association between pioglitazone exposure and all-cause mortality were not included. The most common cause of death in patients with T2DM is cardiovascular complications.22 Cardiovascular comorbidities were included in the PS, although good balance was not achieved for CHF, 2.97% and 5.46% in the pioglitazone exposed and unexposed cohorts, respectively. Stratifying the analysis by presence and absence of CHF at CED demonstrated similar reductions of all-cause mortality for the pioglitazone-exposed and non-pioglitazone-exposed groups. The imbalance is therefore unlikely to have biased the findings. Also, TV variables for cardiovascular comorbidities were included in the adjusted regression model. Variables such as socioeconomic status and general health may affect both choice of diabetic treatment and mortality risk.23 These were not included in the study protocol and would be difficult to measure consistently across datasets. They may therefore be residual confounders. Observed risk reductions were statistically significant in five of the six datasets which supports the generalizability of our findings. The largest relative risk reduction was observed in Finland (HR 0.54, 95% CI 0.50 to 0.58) and the smallest in the NL GP dataset (HR 0.89, 95% CI 0.71 to 1.11). This may reflect differences in available data or in the care pathway for diabetes in these countries. All of the countries in this study have a publically funded national health service with limited co-pay for antidiabetic drugs during the study period. Nevertheless, the observed reduction in mortality risk may be due to inadequate or inappropriate prescribing in the comparator arm. In agreement with our study, Mannucci’s meta-analysis demonstrated a statistically significant association of pioglitazone use with reduced all-cause mortality (OR 0.30, 95% CI 0.14 to 0.63) in patients at relatively low risk of cardiovascular events and death.15 The primary endpoint for the majority of RCTs was HbA1c. Patients included in the meta-analysis had a mean diabetes duration of 6.6 years and mean HbA1c of 8.1%. This is similar to the mean 4.7 year duration of treated diabetes and mean HbA1c (where available) of 8.5% and 8.8% in the exposed and control arms, respectively, of our study. The major advantage of clinical trials compared with our study is that patients are randomized to treatment. This greatly reduces the risk of residual confounding compared with our observational study methodologies. However, trials included in the meta-analysis were generally of short duration (8–156 weeks) and counted zero or few mortality events (total 56). Our study had a mean follow-up of 2.9 years and counted a total of 10 513 deaths. The results of our study are consistent with an observational cohort study that demonstrated a 23% reduction in all-cause mortality with use compared with non-use of glitazones (primarily pioglitazone) in the UK.18 There were 597 deaths in the study cohort over an average 4.5 years of follow-up time. Yang et al’s observational study17 comparing first time users of insulin or pioglitazone in a US claims database also found a statistically significant decrease in risk of all-cause mortality in the pioglitazone cohort compared with the insulin cohort. In contrast, the large PROactive trial found no statistically significant reduction in all-cause mortality with pioglitazone use compared with placebo in either the 3-year trial (HR 0.96, 95% CI 0.78 to 1.18) or the 10-year observational follow-up period (HR 0.93, 95% CI 0.84 to 1.04).16 24 This study was designed to study the effects of pioglitazone on cardiovascular disease in high-risk patients with pre-existing macrovascular disease and T2DM. Similar results were found in the Insulin Resistance Intervention after Stroke (IRIS) trial, which measured the effects of pioglitazone on cardiovascular disease and all-cause mortality in prediabetic patients with a recent history of ischemic stroke or transient ischemic attack. By 4.8 years, there was no statistically significant difference in all-cause mortality in the pioglitazone group compared with the placebo group (HR 0.93, 95% CI 0.73 to 1.17). Pioglitazone is an agonist of peroxisome proliferator-activated receptor γ (PPAR-γ) indicated for treatment of T2DM. Data show that pioglitazone causes partial activation of PPAR-α. These actions modulate the transcription of genes with favorable effects on fat distribution, lipid and protein metabolism, insulin sensitivity, plasma glucose, inflammation, and vascular endothelial function.25 There are several potential mechanisms that could underlie the association of pioglitazone and reduced mortality. The overall changes induced by pioglitazone suggest a general improvement in various risk factors that might reduce cardiovascular morbidity and mortality.16 Evidence also indicates that pioglitazone reduces the levels of various cardiovascular risk parameters/inflammatory markers, such as highly sensitive C-reactive protein and carotid intima-media thickness, independently of its effect on glycemic control.26 These mechanisms could be the link between treatment and reduced risk of macrovascular disease in patients with diabetes ,16 but more research is needed to confirm this view. Evidence indicates that patients with T2DM have reduced life expectancy compared with the general population.1 2 RCTs provide limited and inconclusive evidence concerning the effect of pioglitazone on all-cause mortality. This large, observational multidatabase European cohort study found that prescribing pioglitazone compared with an alternative treatment decision at the same stage of disease progression was associated with a reduction in all-cause mortality rate. Further observational and prospective studies that are specifically designed to test the association between pioglitazone use and all-cause mortality objective are required. The European Medicines Agency (EMA) mandated the Marketing Authorization Holder of Actos (pioglitazone) to conduct this study. The study protocol was reviewed and approved by the EMA, and the study was granted the ENCePP Seal reflecting transparency and quality in research. The study was fully funded by Takeda Development Centre Europe Ltd.
Dr Tim Williams (CPRD) and Susan Eaton (CPRD) were involved in the study design. Irene Bezemer (PHARMO Institute) contributed in analytical discussions and Eline Houben (PHARMO Institute) contributed to the construction of the analysis file. The Swedish National Diabetes Register provided detailed data for this study. We would like to thank all patients and participating staff who have contributed to the register. Medicines and Healthcare products Regulatory Agency. Rosiglitazone: recommended withdrawal from clinical use. 2010 https://www.gov.uk/drug-safety-update/rosiglitazone-recommended-withdrawal-from-clinical-use. Contributors All authors planned and designed the study. SC, MM, ML, EMH, LK-H, RW and HS performed the data management and data analysis, and all authors interpreted the data. All authors drafted the manuscript, revised the paper critically for important intellectual content and approved the final version of the manuscript. PK supervised the study and is the guarantor. Patient consent This is a register-based study with anonymous data and no patient contact. Data sharing statement Criteria and process for sharing the analytical country-specific datasets and meta-analysis dataset for third parties is defined in the study protocol available at the ENCePP E-Register of Studies.